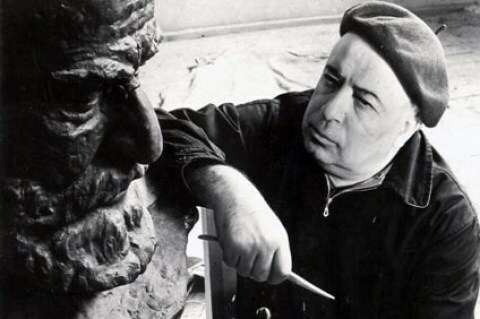 Sarkissian’s most recognizable works are the statues of Hovhannes Tumanian and Alexander Spendiarian in front of the Yerevan Opera House (1957), which he co-authored with Ghugas Chubarian, and the statues of Mesrob Mashdots and Sahak Bartev in the courtyard of the main building of Yerevan State University. Ara Sarkissian's participation in the Operation Nemesis and his involvement with the Armenian Revolutionary Federation had remained unknown in Soviet Armenia for obvious political reasons. However, in the last years it has been disclosed that his dismissal from the post of director of the Institute of Art in 1959 was due to the fact that he had a brother in Greece who was an A.R.F. leader and whom he met that year in Brussels. It is suspected that his sudden death on June 13, 1969, two days after being discharged from the hospital after a surgery for a broken foot, was linked to the previous discovery that the sculptor had been involved in the Operation Nemesis four decades before.